* When is it an appropriate time to second-line? Any celebratory occasion is the right time for a second-line. 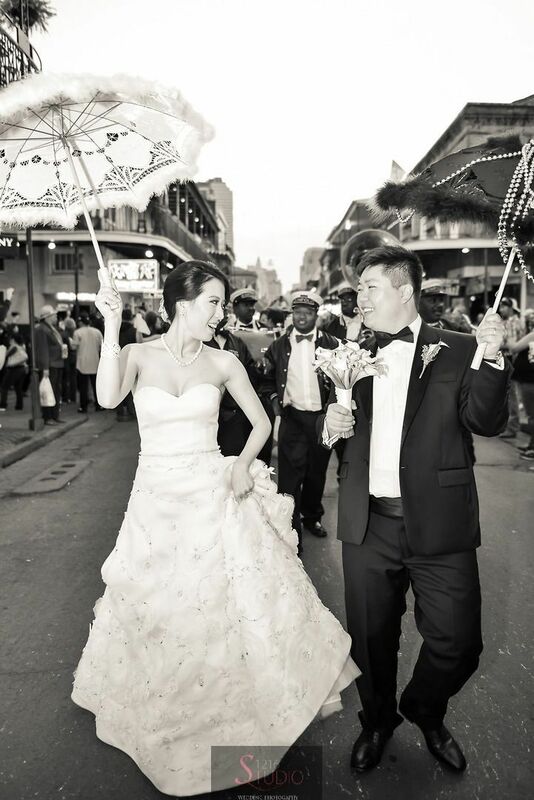 For weddings, some couples choose to second-line immediately after the wedding for the recessional, leading guests to the reception. If the wedding and the second-line are in the same venue, the second-line may give the vendors an opportunity to “flip the room”. Other couples wait to second-line at the end of the reception (which encourages guests to move out of the venue and to the next destination). The timing depends on the specific needs of your event. There is no wrong time to second-line! *How can elderly or disabled guests enjoy the second-line? We recommend hiring a Pedi-Cab driver for anyone who may not be able to make the walk. One Pedi-Cab can comfortably hold two people. Let us take care of the reservation for you, and you’ll be riding in style! * What if it rains? It never rains on our parade! Seriously though, it so rarely happens. The weather in New Orleans is very unpredictable and changes quickly. Second-lines are rain or shine events. In the event of light rain, the band will perform. In the event of a complete wash-out, the band will perform inside if the client has provided a venue. * Can I apply for the parade permit and police escorts myself? The service we offer is truly a worry-free one-stop shop. Of course, you can apply for the parade permit and police escorts online. However, we strongly recommend our parade planning service, which includes planning the route, securing the parade permit and police escorts, and having an on-site coordinator to make sure everything goes off without a hitch. Leave the planning to us, and let the good times roll! *I have a small group, do I still need a parade permit and police escorts? Yes, the City of New Orleans requires a parade permit and police escorts (two motorcycles and one tail-car) in order to parade in the street. There is no second-lining down the sidewalks. *Is it customary to tip the band? Tips are, as we say, “lagniappe”. They are appreciated, but not expected. For weddings, it’s customary to tip the band $20-$25 per musician. This should be handed in an envelope to the coordinator, or the band leader.